On a desolate desert planet, a youngster eeks out a living in relative anonymity. That is until the day that a cute and loveable droid appears who is linked to some intergalactic civil war and has escaped a precarious situation. Inside the droid you see are some top secret plans that are wanted by both the good guys and the baddies. Youngster and droid become embroiled in said war and run in to a rogue-ish smuggler and his woolly side kick which leads to them joining the plucky rag tag resistance against the might of the big and bad Empire … sorry First Order. So bad are they that they have developed a space station so powerful that it can destroy whole planets and … well, you get the picture … Reading through this adaptation then feels, somewhat like an extended highlights package of the two hour thrills and spills fest that was the film. Sort of like a Match of the Day for the movie. Characters and adventures come and go, flying by at a pretty breathless pace which does create an exhilarating level of excitement but has the effect of not really letting the big emotional moments have the same wallop as they maybe deserve. As we all know as well, there is a very big emotional moment towards the end. Characterisation is at a minimum as a result and I can’t help but feel that too much of the plot is sidelined in favour of action and moving the story forward. The book needs to have been twice as big to be honest. 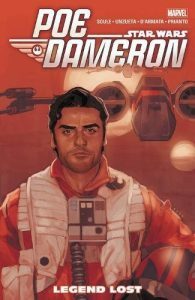 Talking of characters, one of the new addition to the galaxy far, far away is top X-Wing pilot Poe Dameron. A sort of Wedge Antilles for the new trilogy. 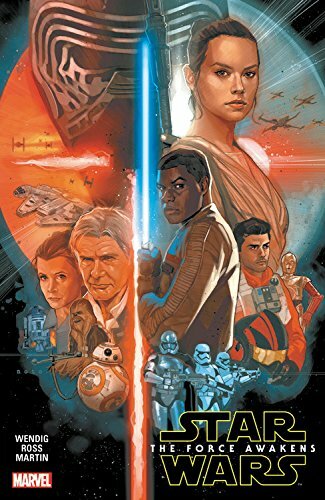 So popular was Poe, that he’s been wazzing about and getting in to all manner of scrapes in his own monthly title which spins the tale of how he arrived at the situation we find him in as The Force Awakens opens in Lor Tan Sekka’s hut. This scene is granted a mere three pages in the adaptation mentioned above(!) which doesn’t really do it justice as the menace and ruthlessness of Kylo Ren and his crack unit of storm troopers is not fully realised and neither is Finn’s pang of conscience as the storm trooper for who storm trooping is not the life.